Traditional Irish dance dress designs display a stiffly pleated skirt on a dress with long arms. The skirt is short to draw attention to the legs and feet of the dancer as Irish dancing concentrates on intricate and repetitive footwork for effect. The dress designs of dance schools are fairly simple for novice dancers and the dresses would generally be the school colors. Irish dress designs from dance schools would have the school emblem emblazoned on the front of the dress to distinguish the outfit from other dance schools. Dress designs followed folk attire and were fantastic representations of traditional rural Irish clothes. The dress designs were chosen to depict the heritage of Ireland and the uniqueness of Irish dancing. Most Irish dance dress designs have high collars and flared cuffs. The stiffened skirt would be in fabrics like wool, silk and organza. Sequins and lace would be intricately sewn into the design in more recent times. This is in keeping with the performance traditions of Irish dance. 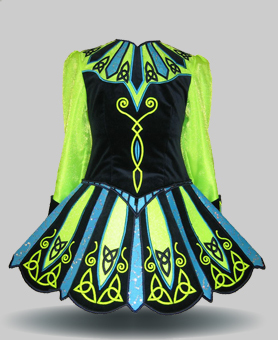 Irish dance dress designs for solo dancers encompass a wide variety of styles. As the dresses are worn by dancers for Irish dance championships, the dress designs have to be more elaborate with high attention to detail. The dresses need to be hand tailored to the exact measurements of the dancer. For this reason, solo dance dresses are ornate and costly. Irish dance dress designs for competitions must rival those of other dancers and make the dancer stand out from the crowd. The use of special fabrics like silk and velvet aid in making the dress design spectacular. Shiny sequins catch the lights on the arena and showcase the dancer to excellent effect. Dancers complement their dress designs with stage makeup and fake tans. This avoids their pale skin from looking pasty under the bright lights on stage. Young girls entering for competitions have lately been banned from using makeup and tanning solutions to enhance their appearance. Irish dance dress designs are special designs for Irish dancing. They showcase the dancer’s legs and thus the dance dresses have stiff skirts and long sleeves. Solo dance competitors normally wear very elaborate and valuable dresses for championships.